When Sir Ranulph Fiennes and his Ice Team set off on The Coldest Journey to conquer the last great polar challenge, crossing Antarctica in winter, Codan Radio Communications was selected to provide the HF radios that would guarantee communications from the harshest environment on the planet. “To provide communications from one of the remotest and coldest places in the world you need extraordinary radio equipment that can withstand the rigours of the journey and perform in the extremes” said Sir Ranulph Fiennes, Expedition Co-Leader of The Coldest Journey and one of the world’s leading explorers. “We selected Codan as we knew their HF radios would guarantee communications, and they did not let us down”. Paul McCarter, the communications advisor for the expedition, worked with Sir Ranulph for over a year to gain support from global companies to utilise the very best equipment for the communications challenge. The final array of equipment included HF Radios, satellite base stations, an array of navigation equipment and short range marine and land hand held radios. When the expedition was drawn to a close the communications equipment was handed over to the International Polar Foundation. They were especially pleased to receive the Codan HF radio as they need guaranteed communications and could not believe their luck to receive a world class radio system for free. 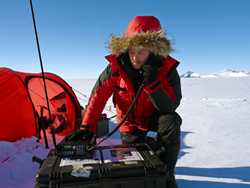 “The Codan HF radio is such a great piece of kit to have, given where we are we need reliability” said a representative from the International Polar Foundation. The expedition named ‘The Coldest Journey’ was tasked with ensuring that Fiennes and his six-man team could traverse the South Pole in polar winter, a feat so dangerous that it has never before been attempted. It required the very best equipment just to keep the team alive throughout the six month expedition. In the end Sir Ranulph was extracted due to frostbite in the early stages of the expedition but the remaining team continued the attempt but had to abandon the traverse due to extremely difficult crevassing.